The end of May half-term saw us on a family holiday in France. I couldn't resist a trip to re-visit the Chemin de Fer de la Baie de Somme, which I first visited four years ago. 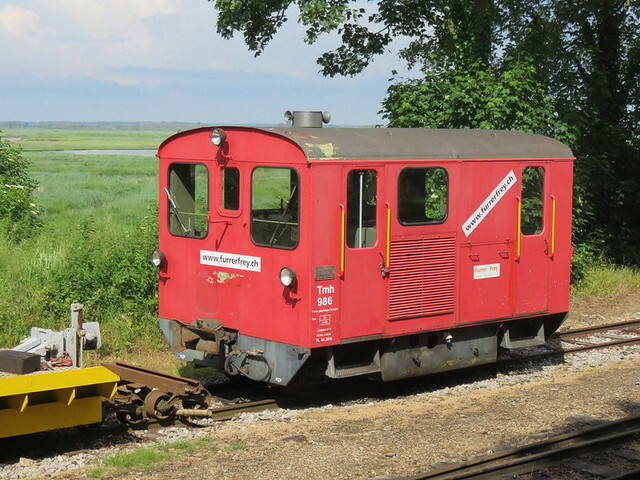 This metre gauge line runs from St Valery sur Somme to Le Crotoy via Noyelles sur Mer, around the Somme estuary, with a branch to Cayeux sur Mer. We took the main route again as that was running a steam service, once again with a beautifully turned out loco and train, through peaceful countryside with views over the estuary. Noyelles is a "through terminus", where the train reverses to take the second part of the line. Last time I visited two trains crossed here, which led to a simultaneous departure in the same direction on parallel tracks. Only one train today (although it did meet a standard gauge SNCF service in the station behind), but opportunity to watch the loco being turned and watered. 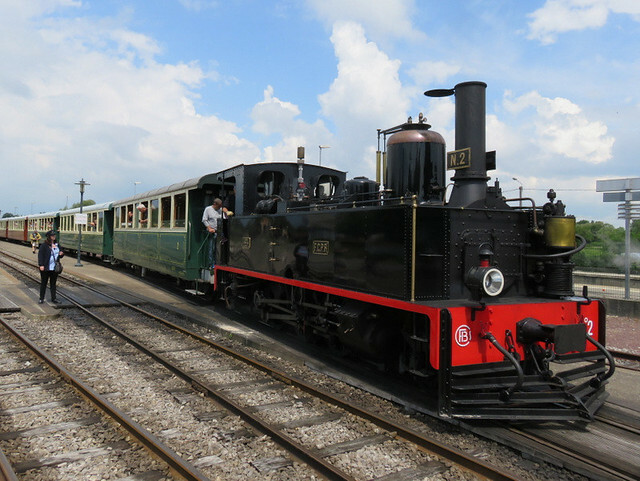 Apparently this loco dates from 1889, and was built for the constructors of the Panama canal, before being used in Puerto Rico. It is now beautifully restored. 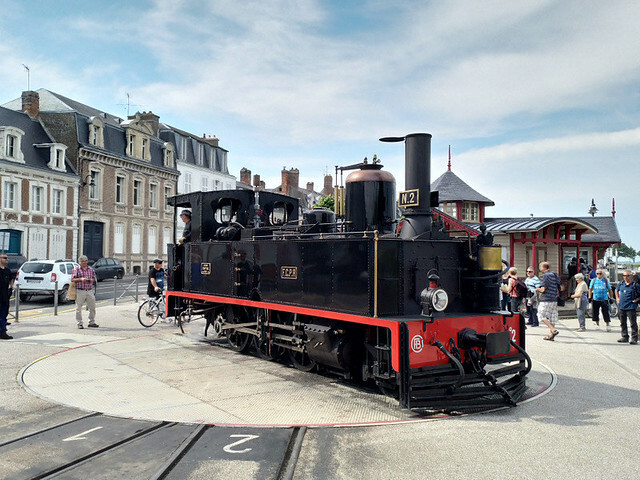 The turntable at the St Valery terminus is on the quayside with inset track, and this delightful inset turntable that is a real crowd-pleaser, in front of the small but ornate station building. One day I must build a model based on this scene! There's loads of inspiration for modellers, such as the little rail-car or drasine spotted in the yard as we passed. The tiny set of bogies in front of it are interesting too, I suspect for moving rails when renewing track. 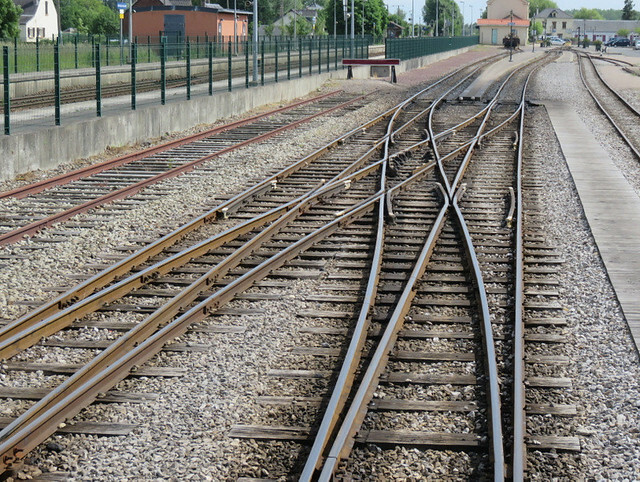 Even the track itself is fascinating, unusually complex for a narrow gauge line, such as this three-way point in front of the turntable at Noyelles. Note the boarding for the crossing. 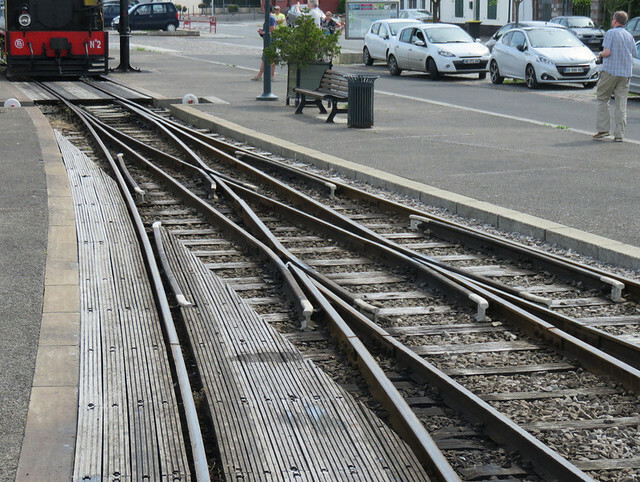 The scissors crossing must be even more unusual; this connects the two running lines from St Valery (right) and Le Crotoy (left) into the platform at Noyelles. 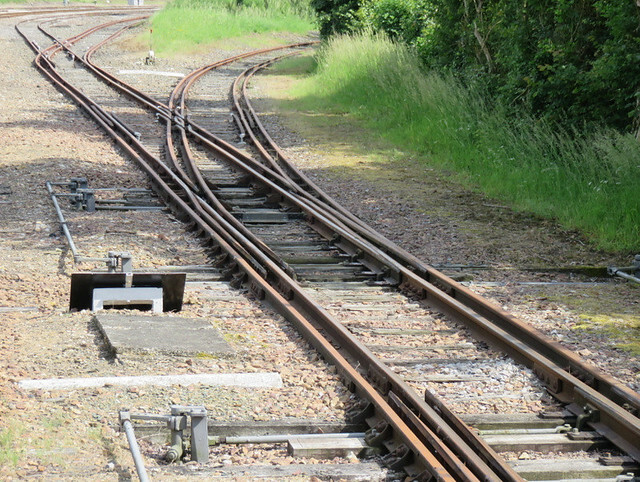 The siding on the left is standard gauge, I've noticed the rail has taken on a different colour. Added to all of that there is dual-gauge track between Noyelles and St Valery, with the metre-gauge set inside the standard (i.e. not sharing a rail) giving rise to some pointwork oddities. I assume this is so SG wagons can be moved by NG locos.